It's been a hot minute since I've posted a new recipe. This may or may not have to do with the fact that it's also been a hot minute since I've cooked anything. But I finally sifted through my healthy food board on Pinterest and I'm back in the cooking game! Dominos is officially going to be receiving far fewer orders from this household (fingers crossed). Spray skillet with non-stick spray and heat over low heat. Add chopped onions. Allow 5-6 minutes to soften and caramelize. Remove from heat and set aside. 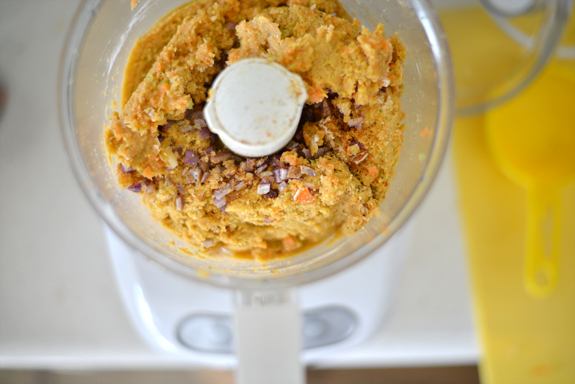 In a food processor, add broccoli and chopped carrot, pulsing until very finely chopped. Add chickpeas, BBQ sauce, brown sugar, flour, cheese, onions, salt, pepper, paprika and garlic powder. Process until combined but NOT pureed. Carefully remove from bowl and form into 6-12 patties (depending on how thick you'd like your burgers to be). Refrigerate (or freeze) for 30 minutes or so until they are firm. Heat oven to 350 degrees. 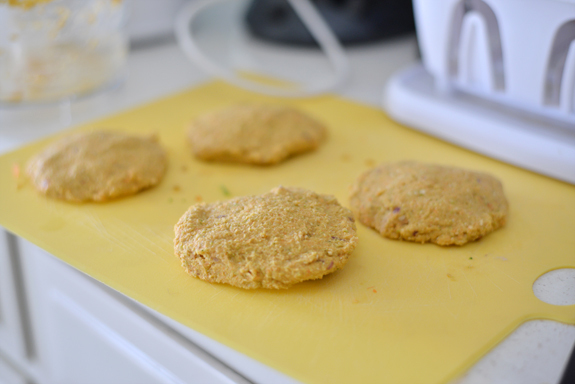 Bake patties for approximately 10 minutes on each side or until outside is crispy. Heat up your skillet to medium heat. Once hot, add burgers and cook a few minutes on each side to toast the outside of the patties. I had a LOT of trouble with batch one of these burgers because I mixed my ingredients too long and made my burgers too thick. Make sure you don't over-process the mixture or the burgers will be mushy in the middle no matter how long you cook them. And be sure not to make your patties too thick or it will be difficult to cook the burgers all the way through - 1/4 to 1/2 inch thick should be good! Serves 6-12 at 140-70 calories per serving.